What happens when quick-response code meets with glucose sensing? Today, diabetes mellitus and hypoglycemia severely harm human health and daily life. For example, the diabetes increases the risk of cardiovascular disease and of early death. However, conventional glucose sensors containing spectrophotometry, spectrofluorometry, liquid chromatography and flow injection analysis normally suffers from draw backs such as rigorous operating conditions and high costs. Hence, it is still highly urgent to develop novel platforms for sensing glucose with easy operation and quick response. Fig. 1. (a) The forming mechanism of dual-PBG signals for the 2D optical code. (b) The set-up for real-time glucose detecting with the 2D PC code and its building mechanism. 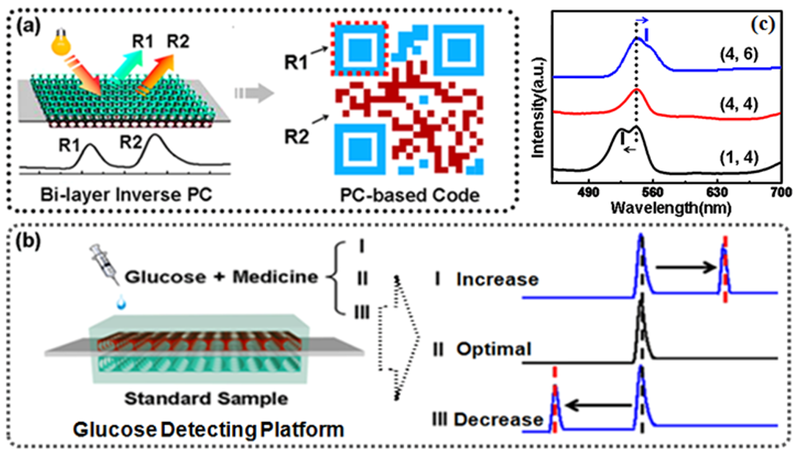 (c) The practical application of the 2D optical code in real-time glucose detection. Recently, the researchers from Nanjing Tech University designed a chemical-oriented two-dimensional (2D) optical code with the dual photonic-bandgap (PBG) optical films for real-time glucose detection. Similar to the timing and finder pattern design in commercial QR barcodes, the 2-D optical code successfully integrates double monitor signals into a single unit: one reflex peak serves as control signal, the other one acts as recognition signal, and their superposition Δλ expresses final sensing information (Fig. 1a). Consequently, an in situ glucose monitoring system, with synchronous optical signals from the control (bottom) and sensing (top) layers of the 2-D optical code, can be set up (Fig. 1b). When the glucose concentration deviates the standard glucose solution, the 2D optical code can distinguish via the varied optical signal. For instance, the researchers adopted three kinds of glucose samples together with the standard control sample to verify their tentative design (Fig. 1c). It can be found that, when the concentration of the sensing glucose sample approximates to that of the standard sample, the 2D optical code displays overlapped optical signals due to similar refractive index values (Case 1). However, when the concentration of the sensing sample has a considerable departure from the standard state, the peak separation behavior happens (Case 2 and Case 3). Through analysis of their relative positions, the variation tendency can be facilely conclude, which eliminates the need for original state recording and greatly simplifies the real-time analysis of glucose. Fig. 2. a) The spectrum series for the 2-D optical code immersed with: methanol (n=1.329), ethanol (n=1.360), hexane (n=1.375), tetrahydrofuran (THF) (n=1.407), chloroform (n=1.473), and carbon disulfide (CS2) (n=1.630). b) The relationship between wavelength internals and the refractive index of the filling fluids. c) The cycling performance of the 2-D optical code with ethanol. The bottom parts correspond to the optical micrographs of the 2-D optical code immersed with above solvents. More interestingly, with the dual-PBG optical film as the 2D optical code, the researchers also offer chemicals with their own characteristic codes for the first time. Fig. 2a shows the specific spectra of the 2-D optical code film sequentially infused with different solvents. It can be seen that the shift wavelength (Δλ) and the maximum intensity of the reflex peak change with solvents (Fig. 2b). Also, these 2D RPC codes show distinctive color changes during the encoding processes, varying from blue (the blank sample, C-1) to blue-green (methanol, C-2), green (ethanol, C-3), yellowish-green (hexane, C-4), yellow (tetrahydrofuran, C-5), bright blue(chloroform, C-6), and orange (carbon disulfide, C-7). This feature shows the possibility for encoding various chemical solvents with the dual-PBG optical code, and even judging by visual observation. 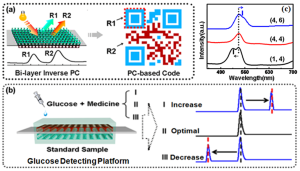 In conclusion, the researchers creatively applied the concept of QR barcodes to glucose sensing application. Specific results from this study will not only present an alternative route towards the design of high performance sensors along with both accurate analysis and anti-jamming performances, but offer chemicals with their own characteristic codes for the first time. Dual photonic-bandgap optical films towards the generation of photonic crystal-derived 2-dimensional chemical codes.